Several years ago, the epic drama, Gone with the Wind, was re-released in theaters all across America. This digitally enhanced, chromatically improved icon, took us back to a time in history when America was experiencing a paradigm shift. My husband and I thought it would be important for our teenage son, Steven, to have the Gone with the Wind experience on the big screen, so we purchased three tickets and settled in for what we knew would be a long evening. After about two hours, we got to the scene where a sullied Miss Scarlet, deserted by Rhett, stood on a hilltop with Atlanta burning the background. She collapsed to the ground, and slowly pulled herself into an upright position. With fist held high, she declared that she would make it through this trial. “As God is my witness,” she proclaimed, “I will never be hungry again.” Then the curtain fell. “That was a strange way to end,” Steven sighed. “Oh, but look,” I replied pointing back to the stage. The words “intermission” appeared on the vacant screen. “You’ve got to be kidding,” Steven said. You know, I’ve identified with Miss Scarlett on several occasions. Sometimes life just gets so complicated. Dreams lay unfulfilled. Plans go up in flames. People walk away. My man doesn’t understand, and my friends run for cover. What will I do? Where will I go? Is this the end? Then as the curtain falls, I think to myself, this is a strange way to end. But I look again and see God pointing to the story of my life as if to say, This, my child, is not the end, but an intermission. Get up. Take a break. Stretch if you must. But your story is not over yet. If you see yourself on the screen, can I encourage you sit down, take a deep breath, stretch, and regroup? The story’s not over yet. Perhaps you’re just at an intermission. As someone once said, we shouldn’t put a period where God put a comma. If you have been feeling like perhaps your life is taking an intermission, join me in the following prayer. Then click over to my Facebook pageand say, I’m pressing on! Dear Lord, sometimes I feel like there is no hope, like the story of my life is running amuck on the sandbar of disappointment. Thank you, Lord, that you never see a situation as hopeless…that what you have begun in me will be completed. Lord, when I make a poor decision, help me to repent and go on with life; when I want to go into hiding, help me to have the courage to come back out of the cave of despair; when I am disappointed, help me to look to You alone, the author and finisher of life. Help me to obey You, no matter what the cost. What would have happened if Joshua got tired of walking around Jericho on day six and stopped? Is there something in your life you’ve given up on? Has God stirred you to pick up the cause and continue on? Perhaps one reason you gave up is because you didn’t feel you were good enough, smart enough, or talented enough to succeed. Girlfriend, don’t listen to those lies! 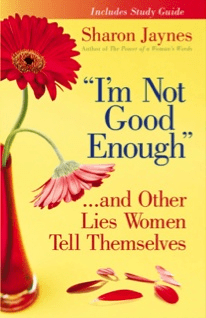 Check out my book, I’m Not Good Enough…and Other Lies Women Tell Themselvesand stand firm in the power of the Holy Spirit living in you! Don’t let the enemy hold you back one more day!